Podium Finish and a new PB! 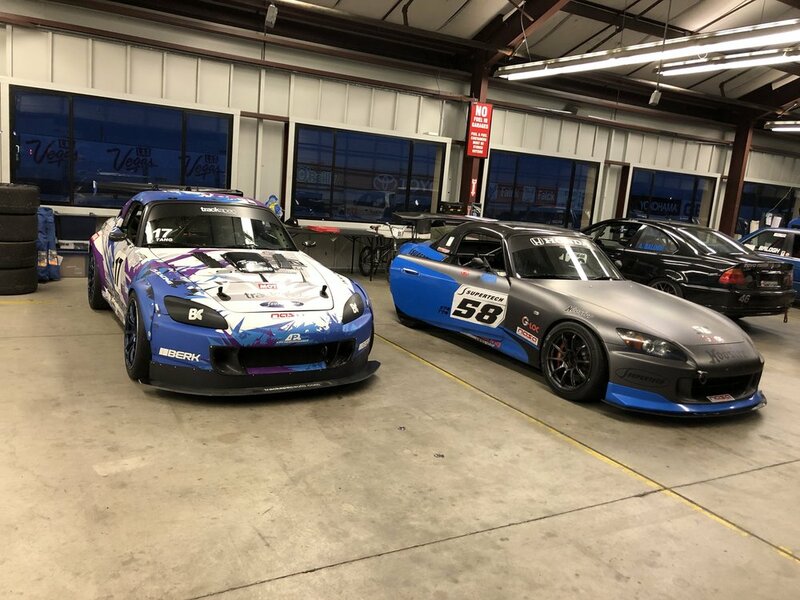 This past weekend (May 19-20, 2018) marked the third round of racing scheduled for this year’s NASA Pro Racing Super Touring championship series here in Northern California. I was thrilled to return with the team to Sonoma, because it’s close to the shop and it also happens to be one of my favorite tracks to drive at (I love the complexity, the narrowness of the walls, and the overall rhythm). Morning practice went fairly well, and I had just ran a new personal best (in ST4 trim) lap-time of 1:49.4 during qualifying when my transmission grenaded. Fortunately, I was able to limp it back to the paddock where we confirmed that the gearbox needed to be replaced. Unfortunately, the schedule was so tight that we would not have enough time to swap in the spare transmission before the race. As such, we had to take a DNS (Did Not Start) for the race. The team sprang into action nonetheless. While Jon and Victoria drove to Fremont to pick up the spare, Drew and Son began removing the broken transmission and preparing “Irene” for the next day. A few hours later, and we were back in business. Or, so we thought. I took the car out, and as I drove around the paddock and the service roads that looped around Sonoma I discovered a huge issue. I could upshift through all of the gears, no problem. But, for some reason I could not downshift from a higher gear into 3rd. The gearbox was just locking me out. We tried warming up the transmission some more (I’m able to monitor the temps in real-time), but no luck. I tried double clutching and rev-matching, but still no luck. This was odd, because the spare had just been rebuilt and inspected recently and we thought it was ready for duty. We took it out again, but didn’t see anything that would be causing the issue. By then, it was dark, cold, and we decided that I would either break it in on track the next morning (and it would just work), or I would just drive without using 3rd gear. Morning arrived, and I was optimistic as I went out for practice. Unfortunately, try as I might I just could not get the car to downshift into 3rd gear. It was still locking me out. This was incredibly frustrating because 3rd is a really critical gear for “Irene” in several turns (T2, T4, T7, and T11). Without it, I was forced to either lug it around those areas in 4th, or over-slow the car by going into 2nd gear and hope that I could get a better run at corner exit. I decided to also enter the car in TT (Time Trials) just so I could get more seat time and learn how to drive the car with mainly 4th and 5th gear. Oddly enough, I beat my personal best from the day before with a new PB of 1:48.9. I ended up qualifying the car P3 for the race. Phew! Despite this solid starting position, I knew I would be in trouble for the race because lugging it in those critical turns meant that I would have trouble closing in on cars in front of me, as well as defending myself from cars that would be behind me. Turns out, I was right. But, what I didn’t anticipate is that the race would have an exciting start with contact between ST4 cars on the opening lap going into T2 (as well as later on in T10), a few spins by cars in other classes, and in the end I wound up driving my way to the podium by finishing 2nd in class, and 5th overall out of 48 cars in Race Group C. What a weekend! A huge thank you to my amazing friends who I’m also lucky enough to have as teammates. Congratulations to the birthday boy, Martin Tagliavini, who finished 3rd both days and to my mentor, Graham Downey, for taking 1st in your very first weekend ever racing Spec Miata. You continue to be an inspiration for me. Oh, and last but certainly not least thank you to my number one fans, Ashly, Rory, and Max. Stay tuned for updates as we will be busy rebuilding two transmissions and making other minor improvements to “Irene” before Round 4 in June! Bonus: Watch the race from my buddy, Mike Lock’s perspective. He’s driving a K24 powered Honda CRX in ST4 class, but was racing in ST3 on Sunday because he hadn’t done a compliance dyno yet.